So as winter ends it is time to actually do something. Somewhere. I decided to make the Middle States my primary target for this year. So a good starting point is the valley of the Mohawk. There are three key points – Fort Stanwix, Triconderoga (just off map to the north) and Albany. The first two should be relatively easy, the last is a real prize. It protects Canada and is a depot. To help with this, a large reinforcing army is sent to Quebec. I'll send some lake bateaux to pick them up and they can move into the Mohawk region by water. In the south, I want to take Hillsboro. Its the last reinforcment producing town and if I hold it in June then that shuts off one block of US replacements. I'm hopeful that Grant will be powerful enough to both displace the US brigade and storm the town. 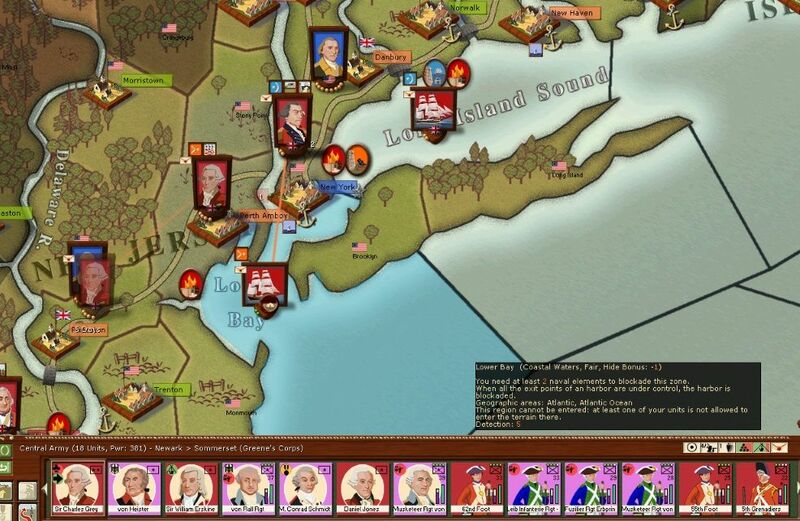 Is Albany your main objective for 1776 sir? 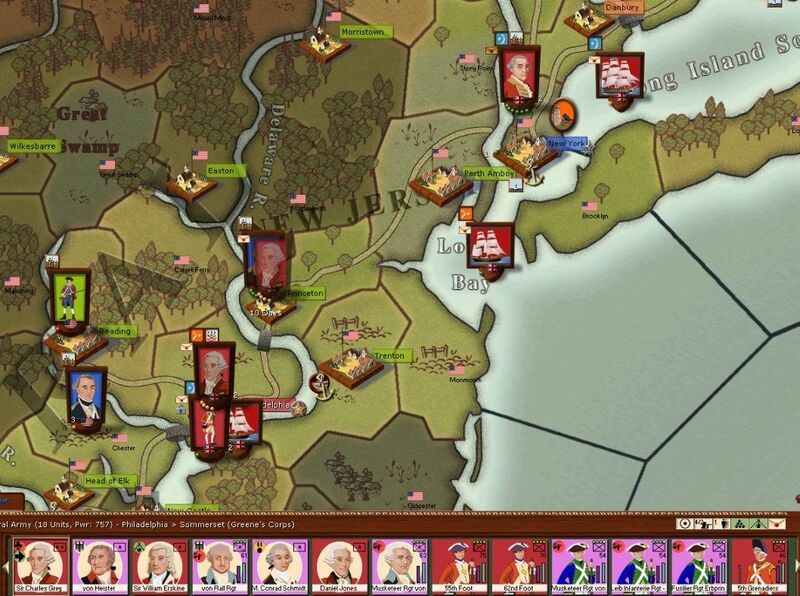 Field Marshal Hotzendorf wrote: Is Albany your main objective for 1776 sir? A regular problem with WiA is interpreting the map. The lack of front lines and the capacity to mutually support tends to give the impression you can go anywhere. In truth, especially with regulars, the road network is critical and supply even more so. I'm more used to the French and Indian wars scenario where supply is a local problem - usually the main armies are small enough that a big city/depot is all you need. In this one I think (and could well be wrong) that there simply is not enough supply in the main combat regions for both armies (ie even in a stalemate one side must starve a bit). So I spent a fair bit of time in the winter turns studying the map (which may have been a better idea at the start?). 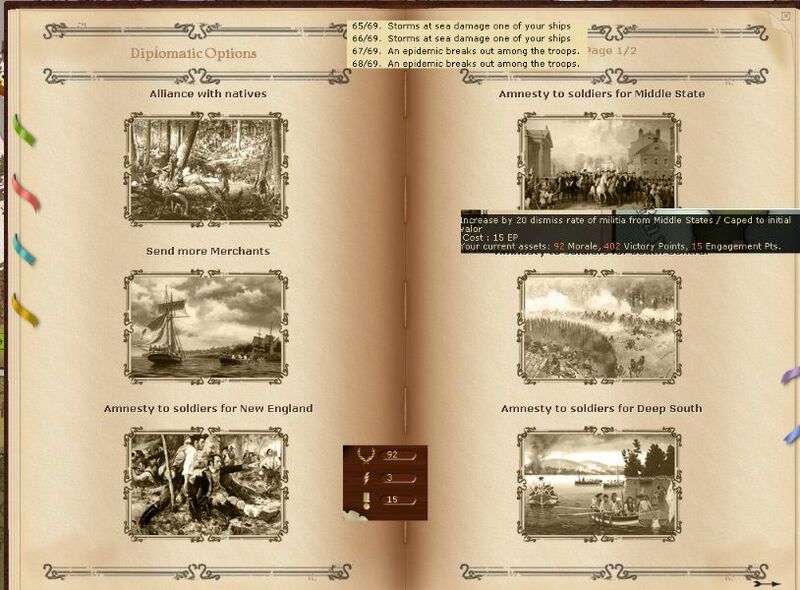 I've decided on a supply denial strategy and to try and fragment the tax evading colonies. 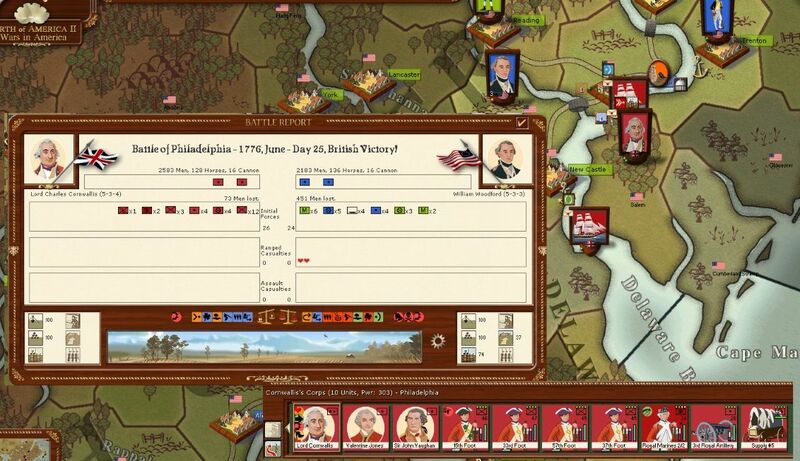 Over 1776 I get 3 large armies as reinforcements and my prime goal is Philadelphia (can say this now as we are well into 1777). Its the largest supply source on the map, it cuts north-south communications and allows me to campaign either into Virginia or along the Hudson. Albany matters as its the only pre-existing depot north of New York towards Canada. So if I grab that, I really constrict the American armies - preferably into New England. My hope is that vigabrand can't maintain the Continental Army as a huge single force. Well a lot happened in this month. Not all of it good. Hillsboro was a stalemate (fighting at the end of a long march means low cohesion) and the initial attempt to take Fort Stanwix was beaten off. Despite that Hillsboro is now mine which prevents the Americans gaining any replacements in the south. But, another nice new shiny army arrives. He's off to capture Philadelphia which my recon has indicated is not really garrisoned. Off to recapture Norfolk – basically I want to hold as many of the ports in the south as I can manage. Oh and heres another army. I decide to use some of this force to collect some unprotected cities in New England but the bulk march towards New York. In Canada, most of Burgoyne's army goes to Oswego but not all the battalions can fit on my lake boats so are sent back to Nova Scotia as a reserve. I reorganise my forces along the Mohawk after the disaster of last turn. As you can see, the Deep South is now mine. Time to squeeze the middle of the revolting colonies. those reading about Senhor Galvez will know this force is really going to be needed in the south come 1779. 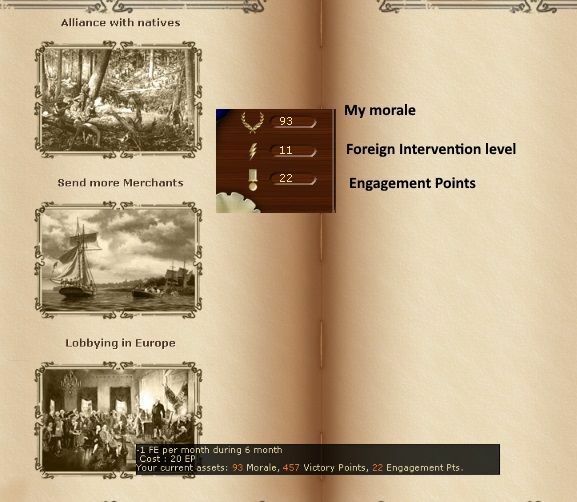 Well its 1776 and I have other plans. I think in all my games of WiA that is the first time I've seen a battle trigger a significant shift of NM. I also retook Norfolk – which had been left undefended. Leslie and his chums are besieging New York, I'm also trying to cut supply by a naval blockade. I decide to bring back the various smaller armies that I'd sent out to capture other cities and either build up at New York or send them to capture the cities between New York and Philadelphia. This will help with my wider supply denial strategy and give me a solid block under my control. 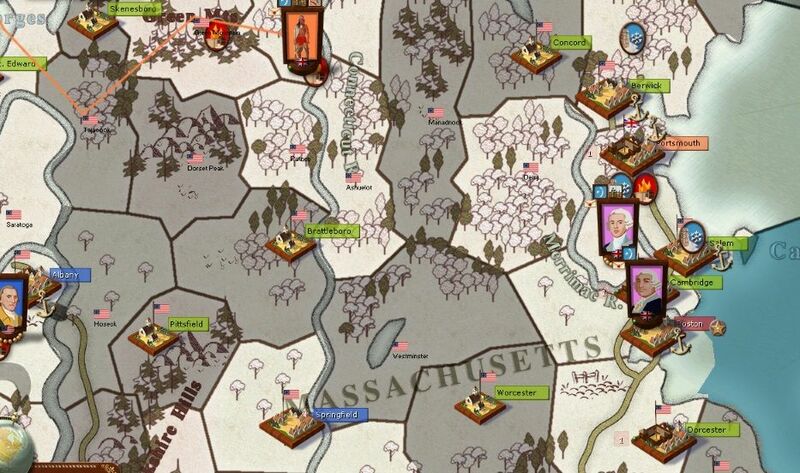 Boston is still garrisoned (weakly) so it will delay the Americans at least one more turn before they can move on. And my Canadian army arrives at Oswego. I'll use the boats to build up a depot here. I'll use them to try and secure the Mohawk valley. The rest of that army arrives back at Halifax. I'll leave it there for the moment. Surprising that Boston was attacked. Had you depleted your force there lately or was it at the same numbers it had been for awhile? Where do you reckon George Washington and his 12,000 men will be off too now?? Field Marshal Hotzendorf wrote: Surprising that Boston was attacked. Had you depleted your force there lately or was it at the same numbers it had been for awhile? Where do you reckon George Washington and his 12,000 men will be off too now?? That sounds like a good strategy. Had you been in the fort in Boston do you believe you would had been defeated? Field Marshal Hotzendorf wrote: That sounds like a good strategy. Had you been in the fort in Boston do you believe you would had been defeated? I'm not sure, the whole thing has been a gamble that has now failed. If I'd retreated into the fort I could have removed some units (would have had to for supply purposes) but then vigabrand could have sent a relatively small force into the province to create a siege. Given the huge malus for fighting when exiting a fort you don't need to match the defenders to bottle them up. Which would have left 10,000 or so of the Continental Army free to roam N America. 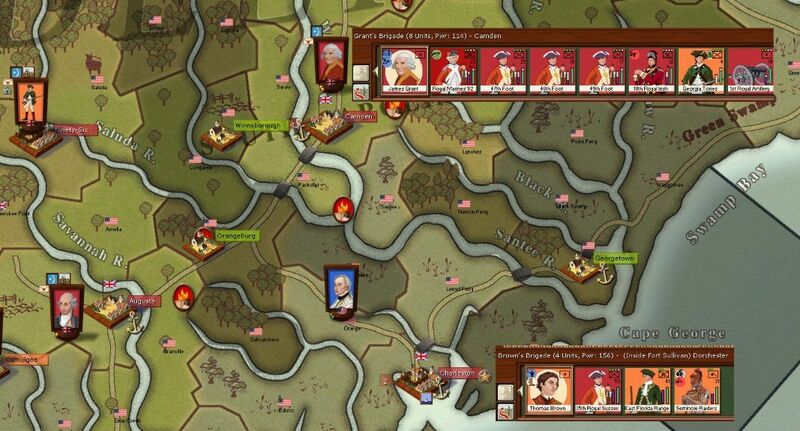 So I've lost an important army, and a lot of NM but gained most of 2 years (it will be at least 3 turns before the Continental Army can reach anywhere important) without having to worry about it elsewhere. The turn resolution saw some predictable battles. 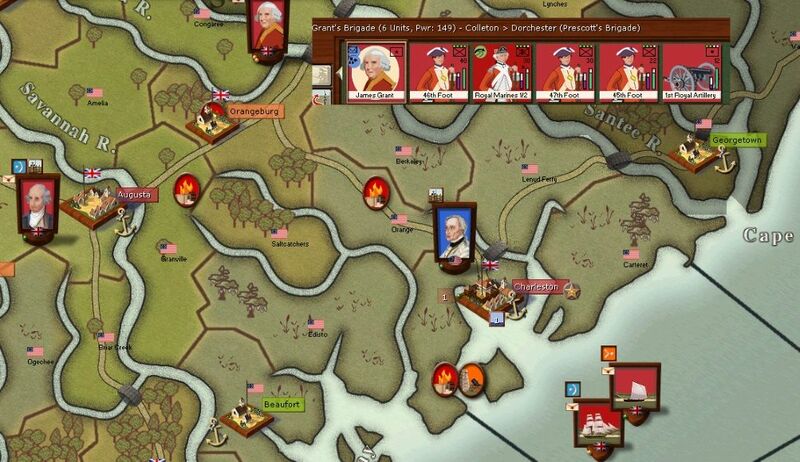 The Americans stormed into Boston and made some especially weak tea to celebrate. 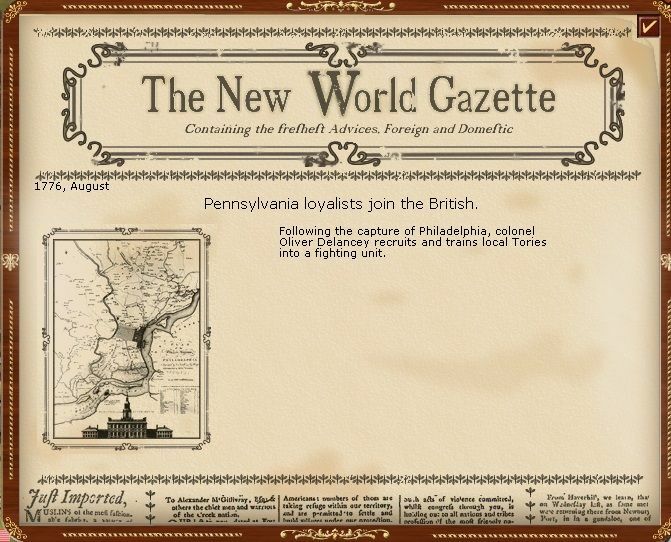 The British stormed into Philadelphia and made tea so strong that every cup in the city was stained orange. And Americans are so impressed with British tea making skills that they want to join the Army. 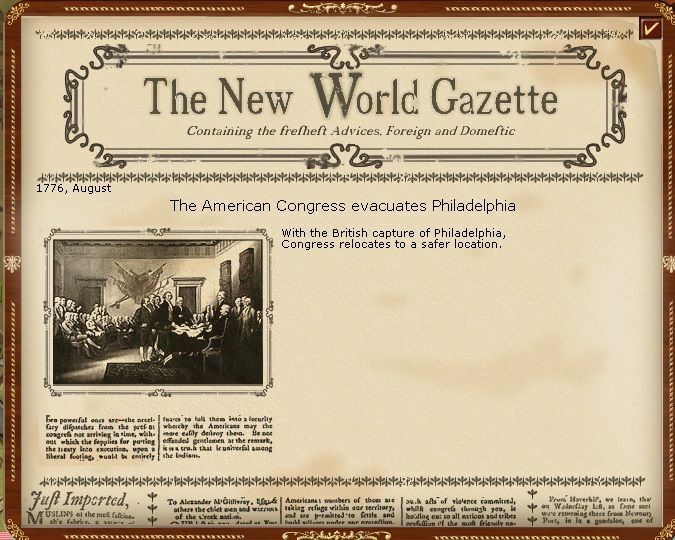 Congressing Americans have to evacuate. 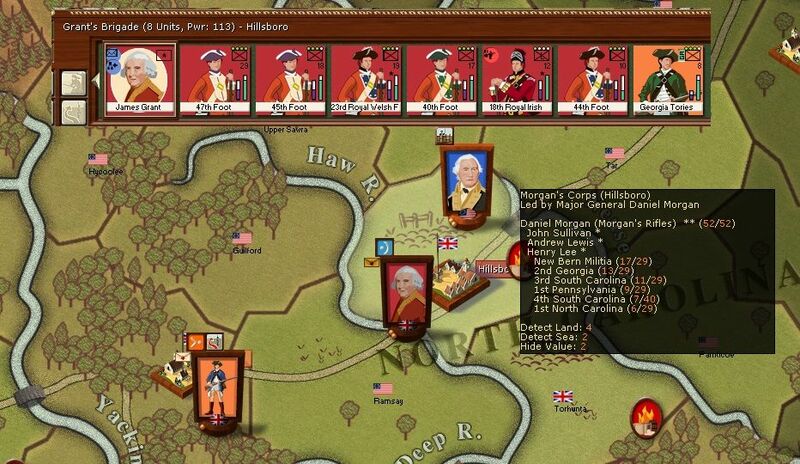 I split up the victorious army at Philadelphia. About half stays to hold the province (and recover supply etc), but Grey's newly arrived army can press north towards New York. I also start a campaign designed to gain control of Virginia. A large American force is still at Albany. It will be at least another turn before my main force arrives. So that means perhaps limited progress due to the risk of winter from October in this sector. Still I decide to retake Triconderogo. I have enough of the Middle States cities under control to make this worthwhile now. So here is the VP situation. Goal now is to collect as many cities out of the South-Central and Middle States groups as I can. loki100 wrote: [From an update long ago]... while some of the army in Savannah is ordered to stop the Americans 'having congresses' in the field and to move onto Augusta. As I was reading the first few updates, I was noticing all the people having congress in the fields and was greatly looking forward to making a comment about libertine, filthy Colonials, but I see you beat me to it. Let's say that great minds think alike. So, you're writing, which means I ought to be reading. And commenting. You know the drill: I can't speak to anything happening in the game, but I'm happy to make all sorts of poorly phrased remarks about the different actors. Oh, and let me tell you that I recently drove through Georgetown, SC, and it is the pits. An enormous paper mill and little else to recommend it (short of Highway 17 which leads out of town). Anybody from Georgetown present here? I apologize in advance. All I can say is: "Oof". That defeat at Boston was large. 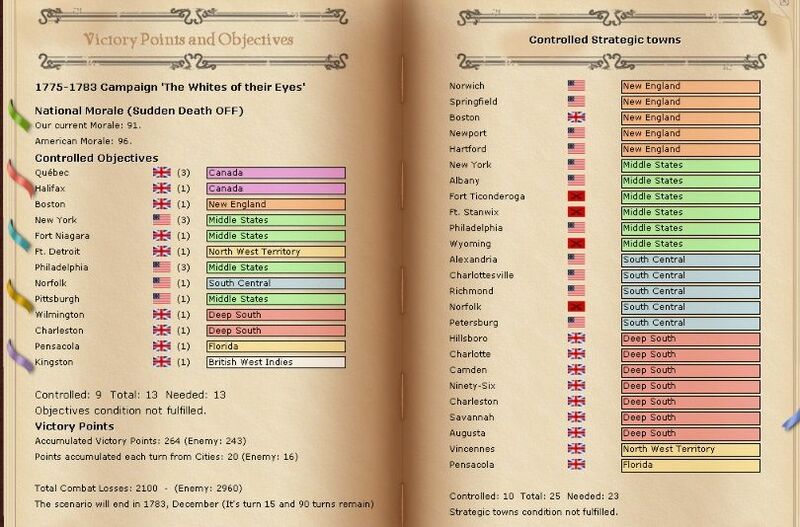 Yes, I hear what you say about the Americans' cohesion being wrecked, about setting up a defensive line around New York, but still, that was a large number of casualties. Still, progress in restoring the rule of law in the South is good and you seem to have a decent handle on things in Pennsylvania. Upstate New York remains in flux and you have a lot of ground to cover in Virginia, but hey, overall things seem to be going well. At what point do you think you will try to engage in a major battle with Washington? Or do you at all want to? Stuyvesant wrote: As I was reading the first few updates, I was noticing all the people having congress in the fields and was greatly looking forward to making a comment about libertine, filthy Colonials, but I see you beat me to it. Let's say that great minds think alike. well it just wouldn't be a proper WiA AAR without some form of juvinile humour? Anyway yes, lets regard this as a war to save the tax evaders from being condemned to weak tea and lax morals for ever more? Stuyvesant wrote: All I can say is: "Oof". That defeat at Boston was large. 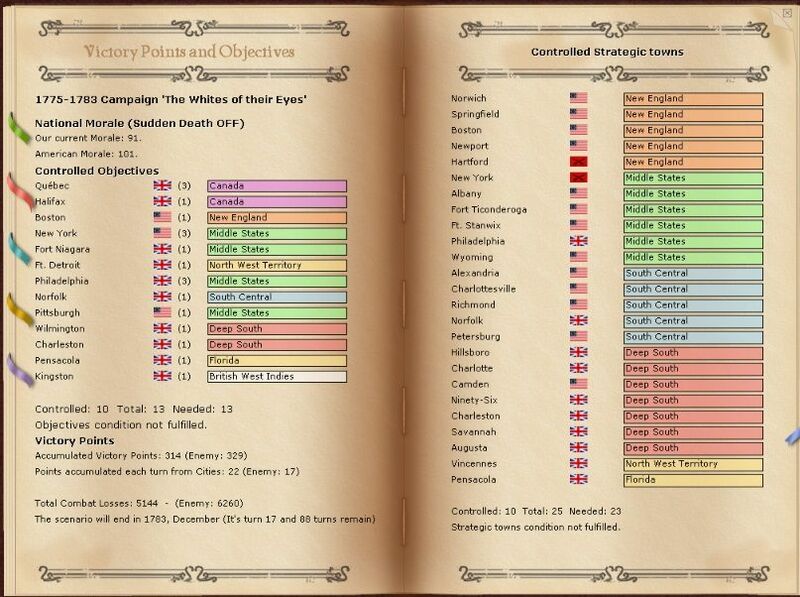 Yes, I hear what you say about the Americans' cohesion being wrecked, about setting up a defensive line around New York, but still, that was a large number of casualties. I think you can read the sounds of someone desparately trying to put a good spin on an awful situation. As I move onto my starvation strategy, that grip on Pennsylvania becomes more important. Philadelphia is one of very few cities on the map where a large army cannot just maintain its current supply levels but actually recover supply that has been expended. This is so critical in WiA as replacement of losses (within an element) is automatic if you are in full supply. So crudely by holding the key supply centres I can slow the extent that vigabrand can draw down his copious replacements - of course having just lost New England hinders this approach. To be honest, I'm not too keen. He's not a particularly good general and I have a few with better traits. 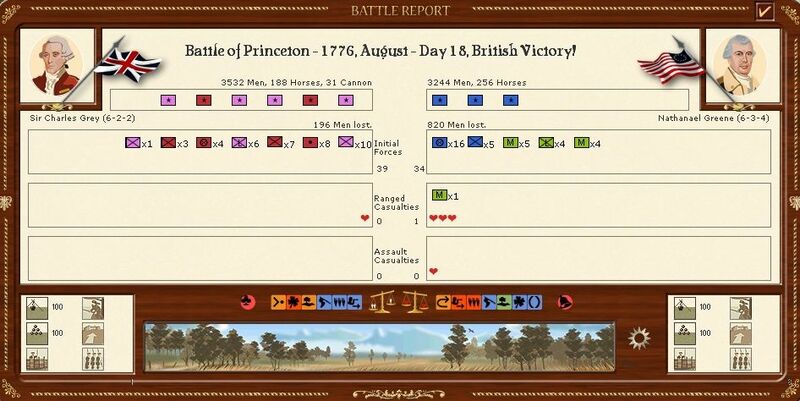 So the Continental Army is beatable (or more accurately I can avoid defeat against it) but big battles drain my manpower and I don't have the potential replacement pool of the Americans. Apart from buying more units via the use of EPs, what I have on the map now is as good as it gets. My plan is to try and deny the sort of cities he needs to recover supply etc, in effect to try and win by attrition and supply shortages till I reach the stage where, if we fight, he loses elements due to earlier non-combat losses. Not sure if this is the best scenario, but thinking over my defeat by Narwhal in this scenario, I never sorted out my own supply bases so entered that death spiral of even if I won a battle I lost elements and so on. On the other hand, all hail Perth Amboy. 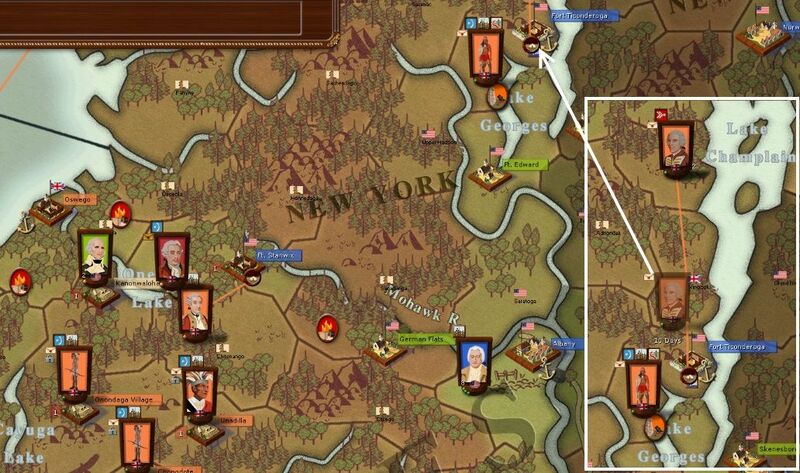 Grey's was the army I sent north from Pennsylvania last turn to reinforce the siege at New York. Clearly 'earl' Grey (for I think he deserves to be more than a mere 'Sir') is on a roll – in fact one could almost say he had many more shades to his character than his name might imply. So here's the Mohawk, at last the large Canadian army has arrived – all these green dots in Oswego. Now I have plans, first a large German army at Kingston (just sourh of the map) will occupy Albany (for some reason I have no picture of the Germans but its a decent 300 power army). Carleton, who has the useful fast mover is ordered to march around Stanwix and take German flats, thus cutting the retreat route for the Americans. I realise this far south that Canadians melt or something but its the only spare brigade I have. As you can see my hope that Washington would hang around Boston, have a chat, smoke some (ed: deleted for libel) and so on was a bit too optimistic. So in a spirit of really wanting to fight during this war. 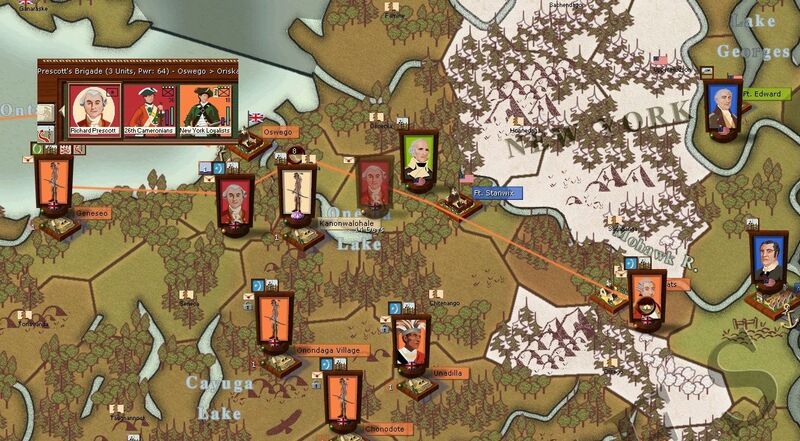 'Earl Grey' turns to go after that weakened American army he beat up last turn. 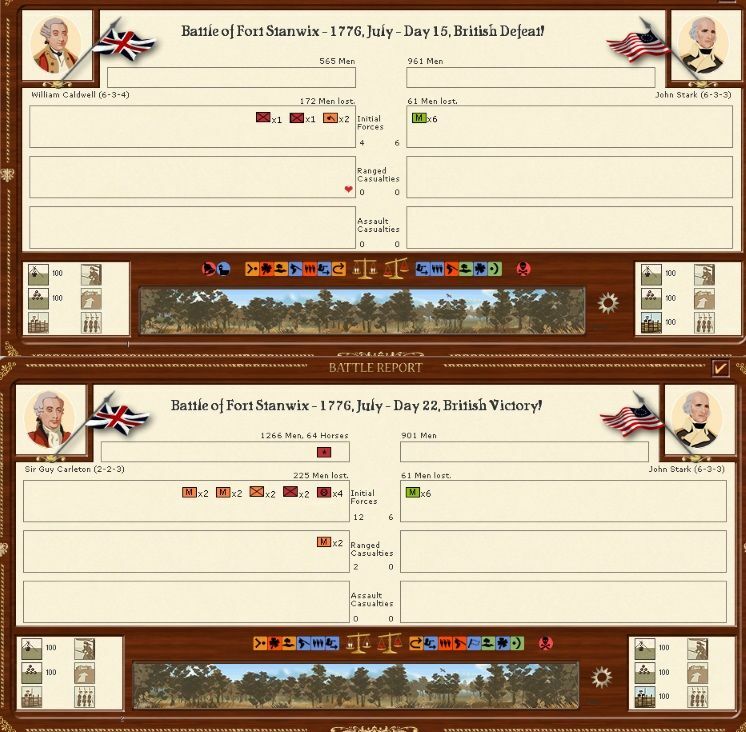 My logic here is that 'Nathaniel' has just lost 2 battles, so probably low cohesion and low on supplies – this is a chance to even up the absolute losses after my defeat at Boston. The German led army higher up the Hudson is off to Albany. 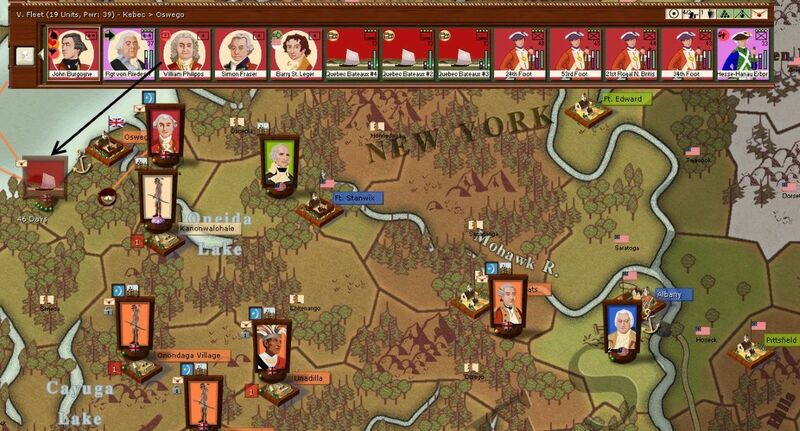 The force at New York is well dug in, so I simply order it to defend, winter is close and I think even a defeat by Washington won't harm my control of Pennsylvania. One final thing, if Washington is in New York, who is in Boston? 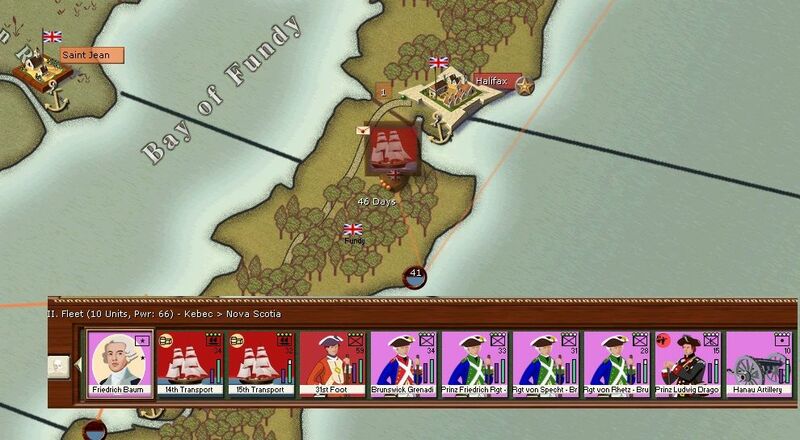 Well as you recall, I sent back some of the army due to reinforce Canada to Nova Scotia, its since been reinforced by some properly dressed Scottish battalions and I'm going to take Portsmouth. Logic here is it not a reinforcement city (holding one out of a batch is probably the worst I can do) so its unlikely to be well garrisoned but it is a large supply producing city. Washington and his mob of angry tea tossers looks intimidating. Hope you can hold him off - he's shown a willingness to fight in Boston, so I hope there won't be a repeat of that <ahem> unfortunate turn of events. Segueing from that, via Grey and his shades... Who's the shady character sneaking behind Washington? More trouble on the way for you? I noticed that also, I wonder what the Americans are planning? interesting AAR and a great game WiA. It seems you catched the embryo of the central Army under Greene. And look what happens if you dont have artyllery Mr. Greene. 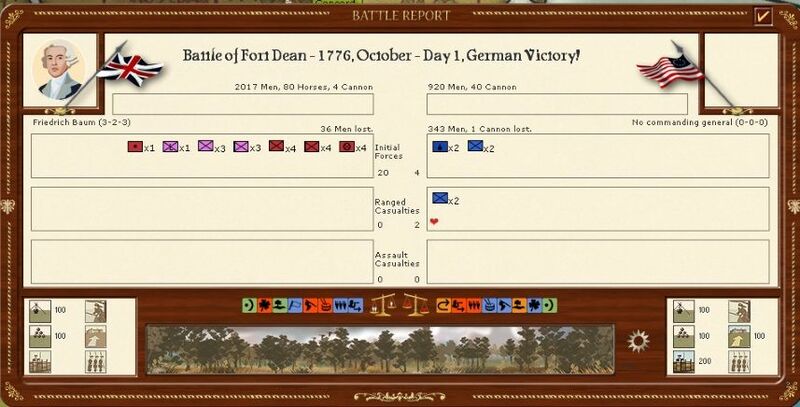 there were several flaws in the plan - one was self-inflicted (I forgot to leave even a minimal garrison at my main depot), one was karma from earlier WiA games where my Indians decided they really wanted to capture Fort Stanwix and the other was that one of my German armies decided really not to bother. 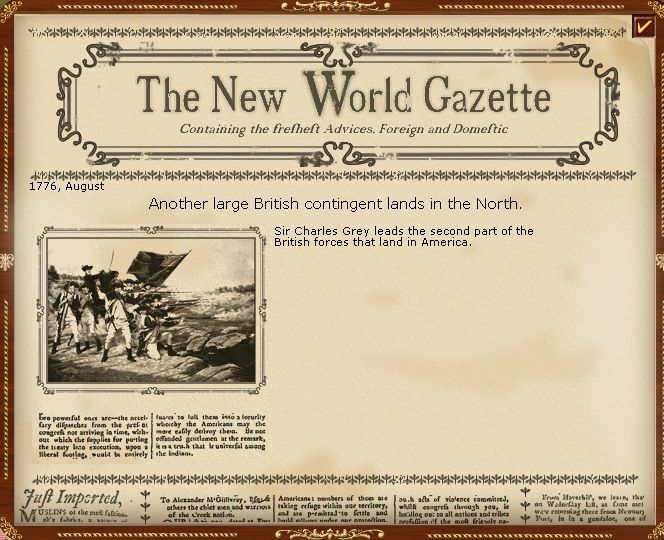 Field Marshal Hotzendorf wrote: I noticed that also, I wonder what the Americans are planning? Leibstandarte wrote: interesting AAR and a great game WiA. 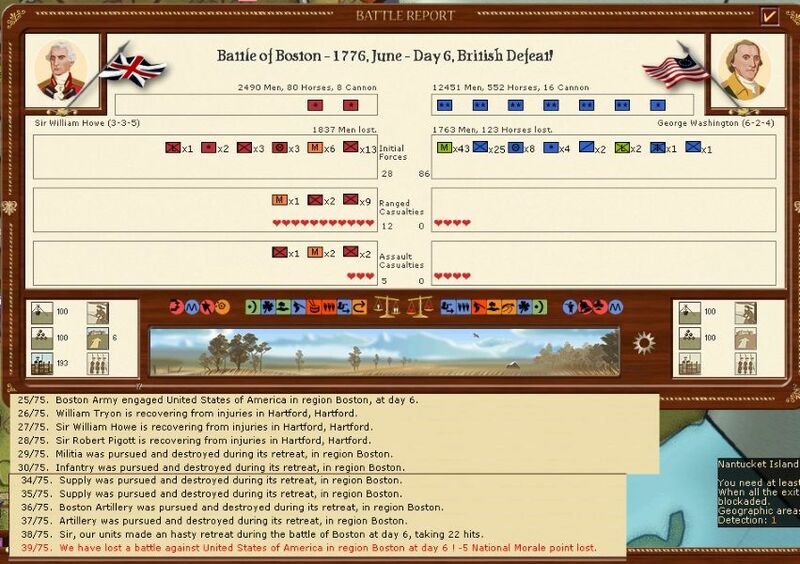 Think that in addition to a larger army (that was almost double the one beaten at Boston), my army was almost all regulars (45 elements of the American force were militia) and I think that is a real gain especially in the assault phase (also around 2,000 of the notional American army was actually besieged in New York). In the meantime 'Earl' Grey carries on beating up Nathanael. Now this was not the good news one would expect. As you can see from the map, the other German army decided not to march past Kingston  and von Riedesel is after Benedict (which matches his orders). Now this is all very good apart from one huge error by me. I forgot to leave a garrison at Oswego which is basically empty. But has just had its depot expanded and contains most of my fleet for Ontario and Montreal. If the Americans realise this I am in deep trouble. So nothing for it but to let Von Riedesel to carry on hunting Benedict and hope the other German led army finally moves to cover Albany. What I can't do is keep Von Riedesel at Albany just in case the Americans do make a grab for Oswego (even if they don't know there is no garrison its still a decent winter supply source). In the south, there is one American formation running around. 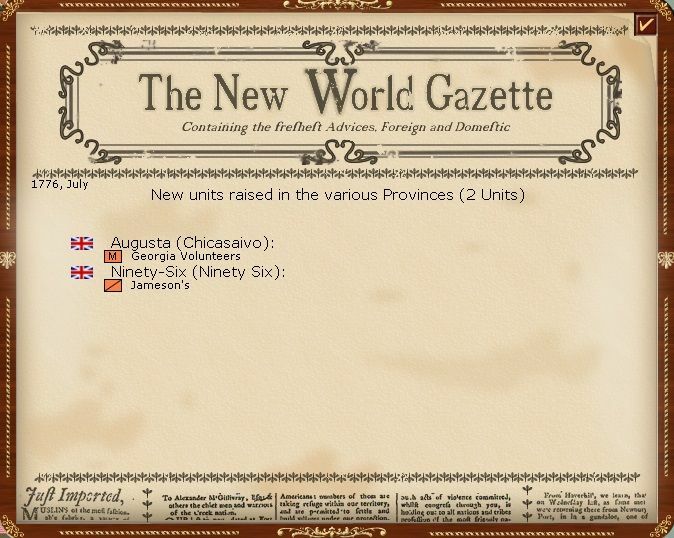 All the key cities are now well garrisoned and I have two mobile forces in the region. Only problem is my main army is low on cohesion and really needs to rest. So the VP situation as the war enters its second winter. The reason why Fort Stanwix is showing as contested is it somehow got captured by my Indians. I need to send a regular battalion there to restore order. That will reduce American control of the Middle States to just 2 cities and in South Central I should be able to take all but either Alexandria or Charlottesville – as there is a relatively large American army hanging around in this region. Interesting... You're pacifying the Deep South: perhaps the northern colonies will gain their independence, while the South maintains its ties to its sovereign? I know, beyond the scope of this game, but an interesting thought. A shame about the denuding of Oswego. I hope you can restore the situation before your opponent takes advantage of it. Stuyvesant wrote: Interesting... You're pacifying the Deep South: perhaps the northern colonies will gain their independence, while the South maintains its ties to its sovereign? I know, beyond the scope of this game, but an interesting thought. I sort of knew that post-war a lot of American royalists took off to Canada but hadn't realised that there was in reality quite a strong north-south element to the patchwork of loyalties either to the British or to the Americans. Its quite well modelled in the game as you have a number of cities down there with quite decent pro-British loyalties and get a number of useful militia reinforcements. I made a bit of a mess taking screenshots for this turn so will try and fill in the gaps with words. That was down in the south and did one of the last US formations in the region no good at all. Fort Stanwix .... another German victory – does seem as if the English army has gone home? 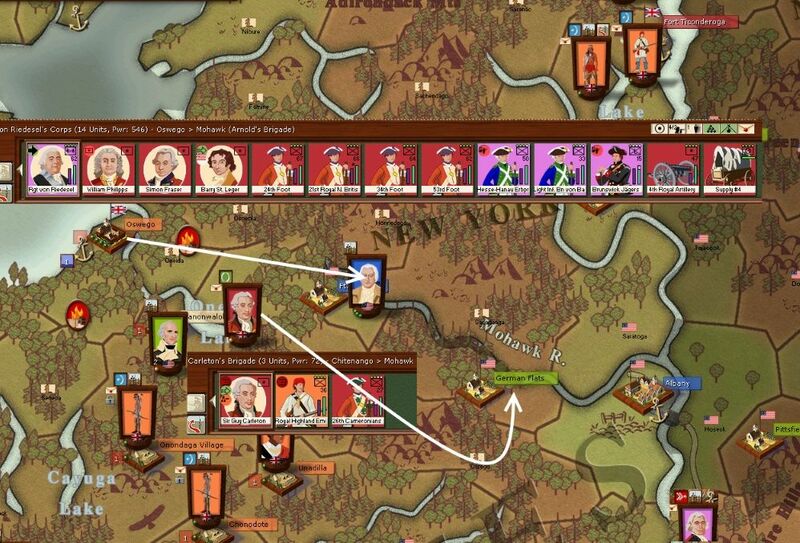 Anyway I subtly suggest that the Americans give up, at the same time as a plague of weak tea threatens to destroy my army. Clearly they are determined to carry on? So, winter. 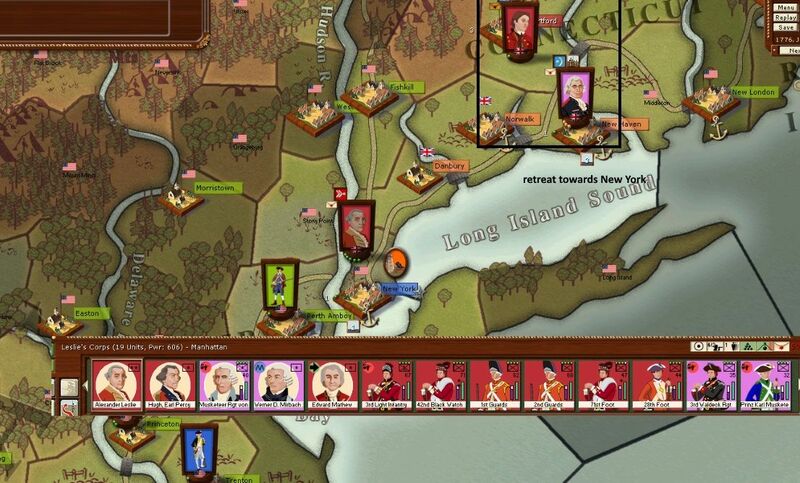 Washington has left New York under siege, not a bad choice as I need to retire to a supply source in any case and gone for Albany, but failed to reach it this turn. So why am I not happy? 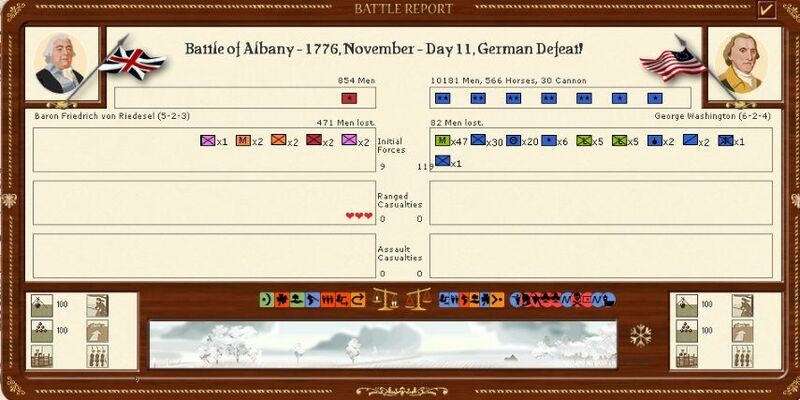 Well Albany has a depot that I expanded but now has no garrison, as the German unit this time decided to march up the Hudson and then head off to Stanwix (the third battle in the screenshots) - I probably told them to do this but I am blaming them not me. On the Mohawk, Benedict Arnold (isn't he meant to defect or something?) is still between three of my armies and Oswego. 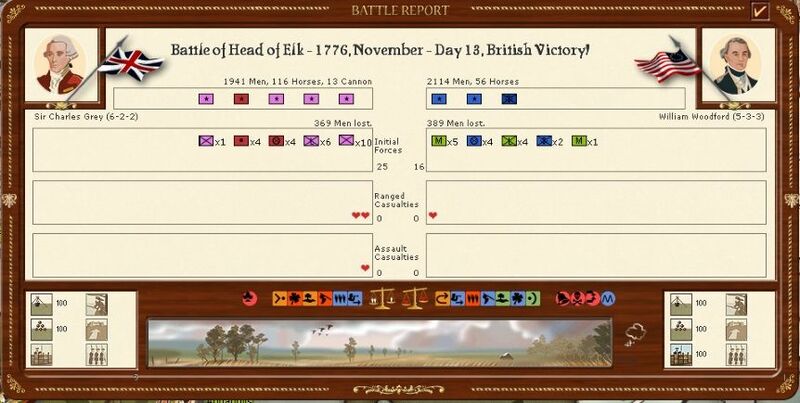 So potentially I have 3 armies on the Mohawk and potentially all could be cut off from their supplies – of course vigabrand didn't know this, and Arnold in particular must be very low on cohesion and probably lacking supplies. 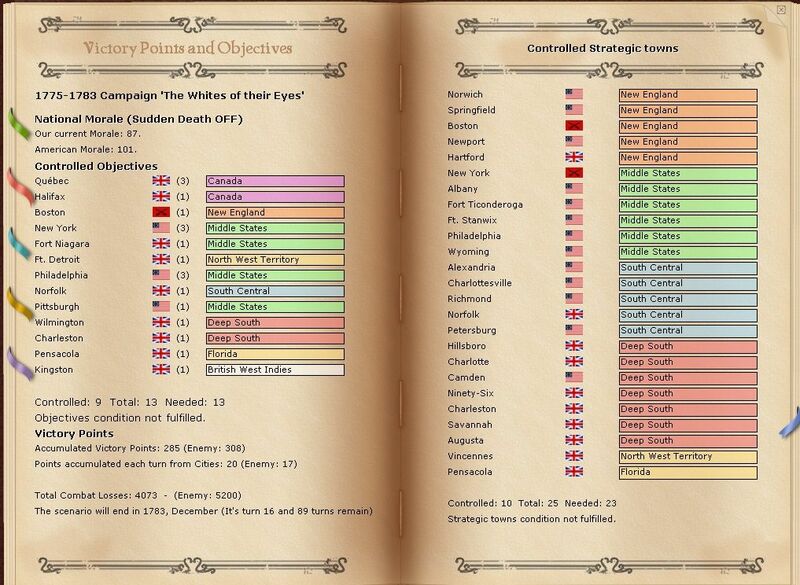 It seems like more generals die in BoA2 than any other ageod game. It is rather harsh, but makes each battle more exciting. 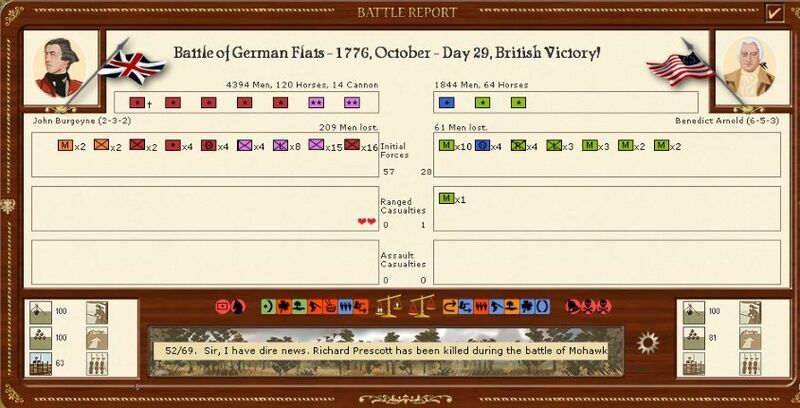 Cardinal Ape wrote: It seems like more generals die in BoA2 than any other ageod game. It is rather harsh, but makes each battle more exciting. I've always rationalised it as a consequence of (usually) relatively small armies and often very constricted terrain, so commanders are exposed - I remember in our French and Indian wars AAR that Narwhal was keeping very close records of all his commanders I *alledgedly* was killing off. 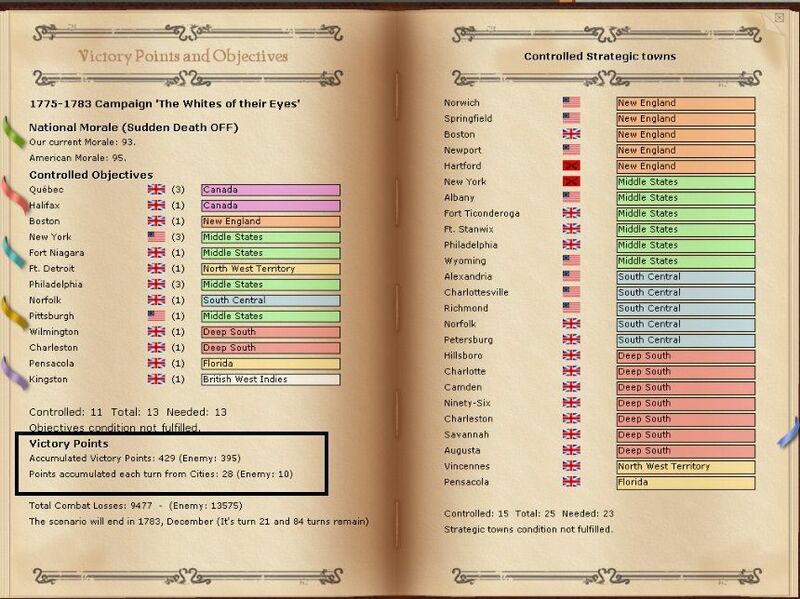 Not sure how it occurs as we spent an age trying to mod Rise of Prussia so that leader death (apart from if an entire stack was destroyed) became a constraint but even simply imposing the WiA rules on RoP only gave us a very marginal increase in a few 3-0-0 brigadiers being killed. 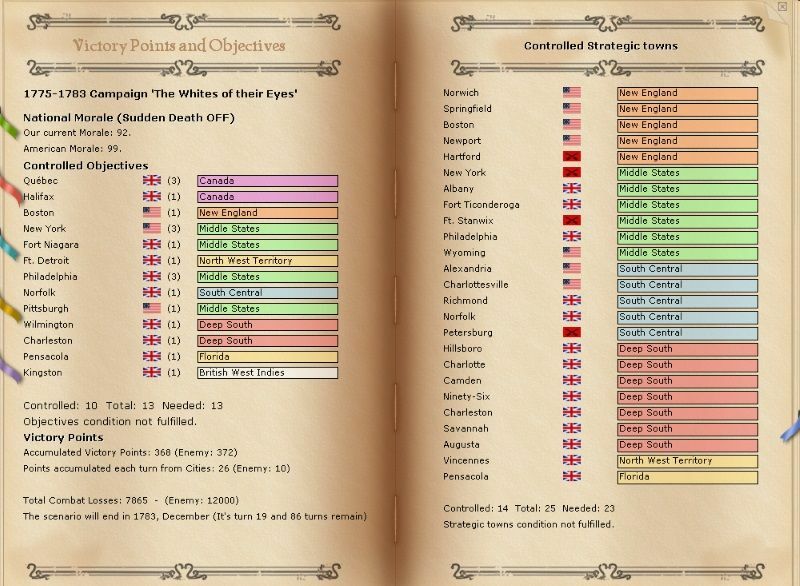 I always feel that one reason the end-game in RoP just doesn't really work is that both sides end up with lots of very good leaders so both armies actually improve over time whereas in reality both sides had lost both their best trained formations and their best commanders and were no longer capable of any inventive operations. Historically speaking, Arnold certainly defected. I don't know if the game models it. I also don't know if the constant drubbings he's receiving at the hand of the German mob would make him more or less inclined to jump ship to the British. 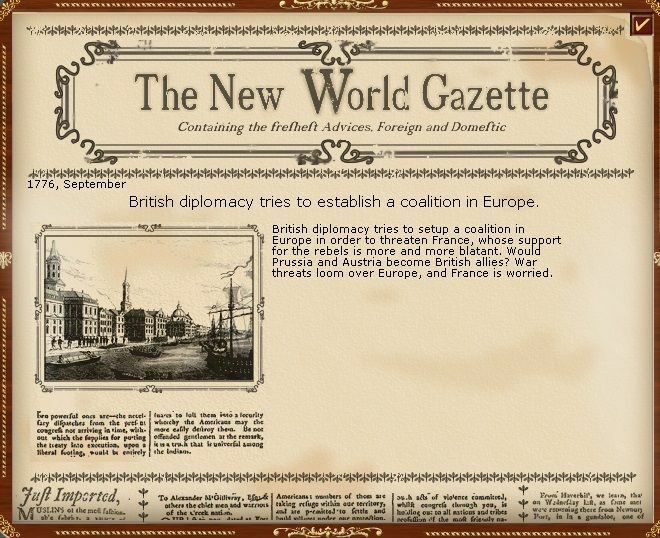 I was surprised that this ceased to be a war where the British are merely trying to collect taxes (and stop the Americans brewing awful tea) and had become a full on German invasion. I'm sure that explains Arnold Shwarznegger? about Arnold that may be the explanation? If he had, say, a German nanny then being spanked again by a huge German with a bayonet may indeed convince him that he is safer where he is? Last turn I made a final attempt to reach Albany before the Americans. Sent a small fast force to try and enter the town. Unfortunately the Americans were there already. In the wider region, Arnold has escaped to the north and I presume is going to try a winter march back to Albany. Oswego is securely held in any case and I'll try to retreat the main army back there – better to pay a one-off penalty for attrition and cohesion than sit out the winter with too limited supplies. Elsewhere 'Earl' Grey has been hunting and delivered the head of an elk – I decided to carry on chasing that American force trapped between Philadelphia and New York. If I can I'd like to prevent it recovering any supply or cohesion over the winter. In New England, Boston is mine again. So here is where we are at the end of the year. I've eliminated all US replacements for the Deep South and limited what they will get from South-Central and Middle States. 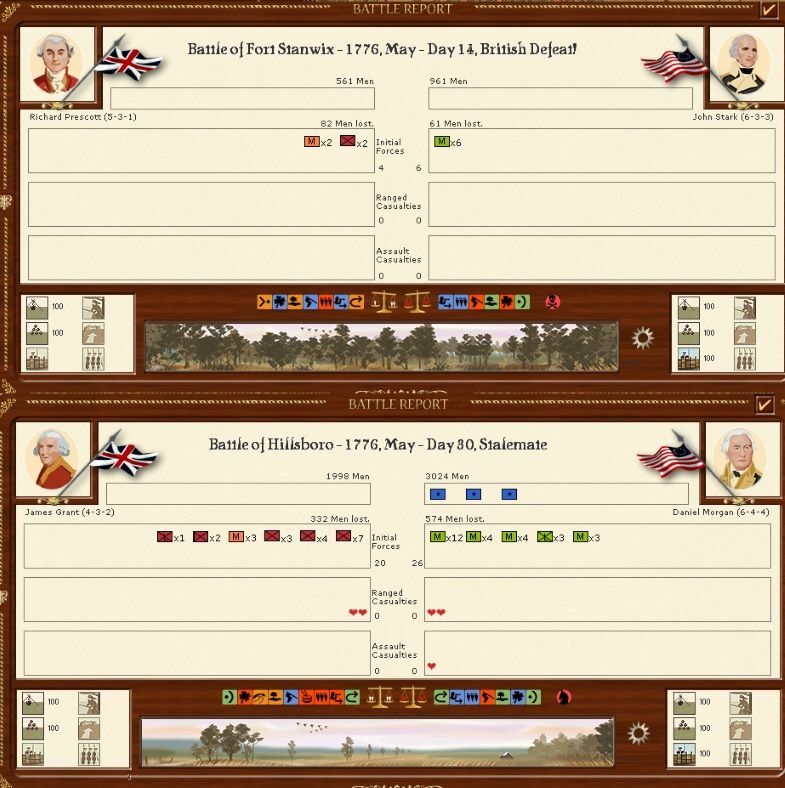 In the latter they will get mostly militia which is fine now as I want to see if I can seriously wreck the Continental Army in 1777 (my last chance before the French intervene). More long term, I am building up a nice VP lead (this is why I risked retaking Boston). That will help me a lot in the end game where it can come down to clinging to a few cities for a turn more. More ambitiously, I am two cities short of having all the provinces I need to control. I need to sort out the mess on the Hudson/Mohawk. 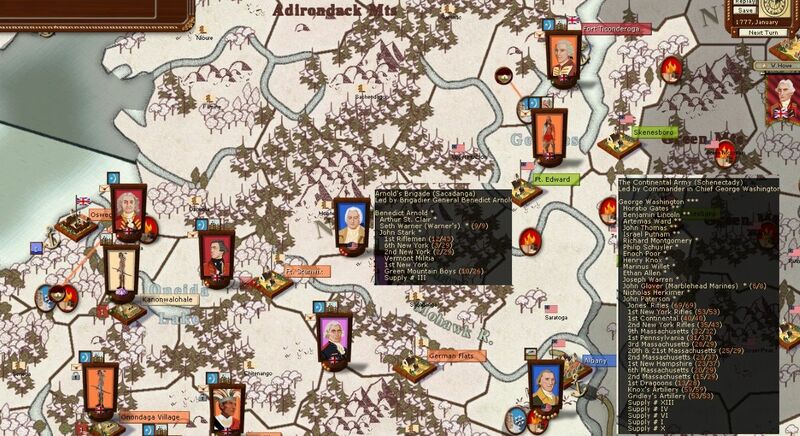 But I think I can put together a strong enough expedition to take Pittsburgh – its relatively isolated and I know from scouting the vigabrand has not reinforced it since the start of the game. This makes a combination of holding onto Philadelphia and taking New York key. 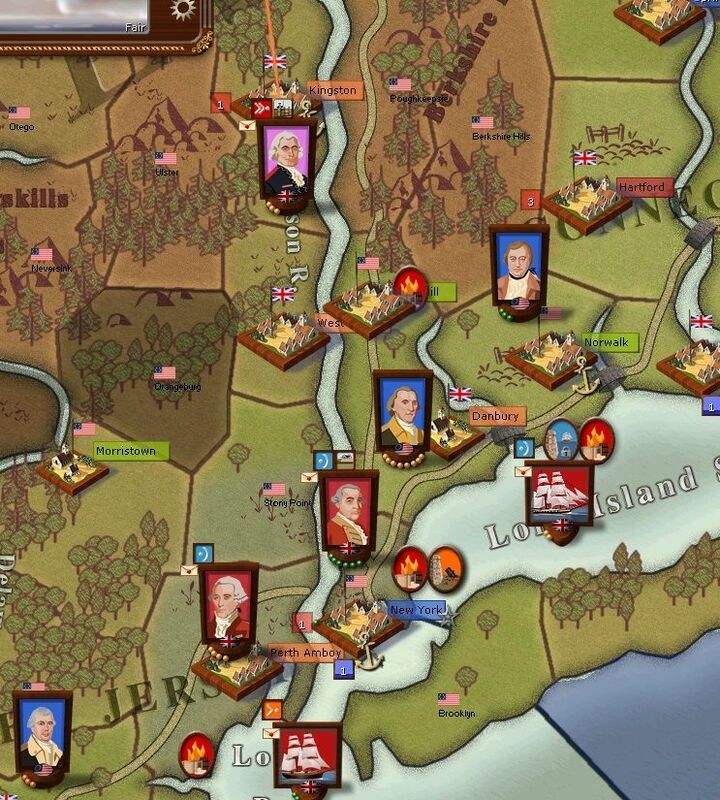 I think I can clear up in New England in 1777 as I doubt that vigabrand can risk sending a strong force away from the Hudson region (which is now looking to be pivotal). With that I can take the few strategic towns that I need to have 23/25. So new year but the old problems. In the south that 'last annoying American unit' (trademark applied for), is running around. Also there are now American ships actually attacking my peace loving trade fleets. This gave me the idea to deal with both problems. 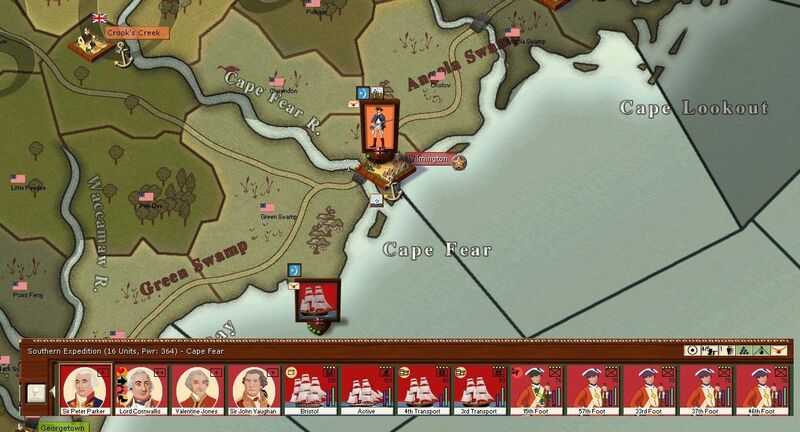 Rather than hunt the Americans at sea (which I've tried and it fails badly), I'm in a position to take out almost evey port – that will also help limit the scope for their remaining units in the south to do much. I'll do this with a few battalions by sea by moving up the coast. 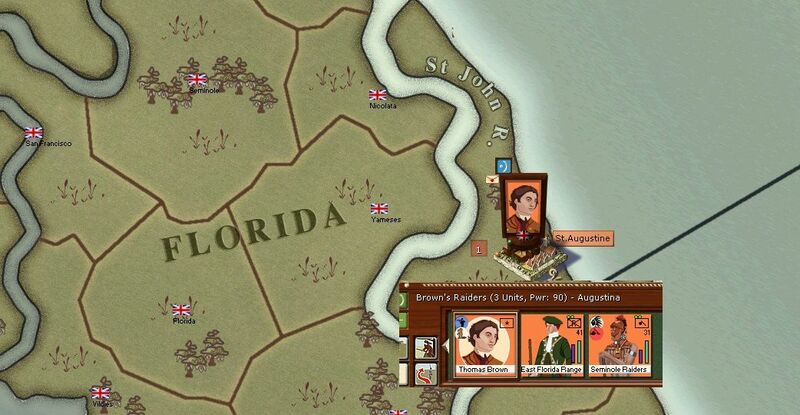 Anyway Grant goes to Charleston to stop any ideas the Americans may have of 'congressing'. Less usefully, David Cameron goes off to lobby in Europe. Arnold has lots of pleasingly coloured dots as his army is low on cohesion and probably is taking attrition due to the weather. 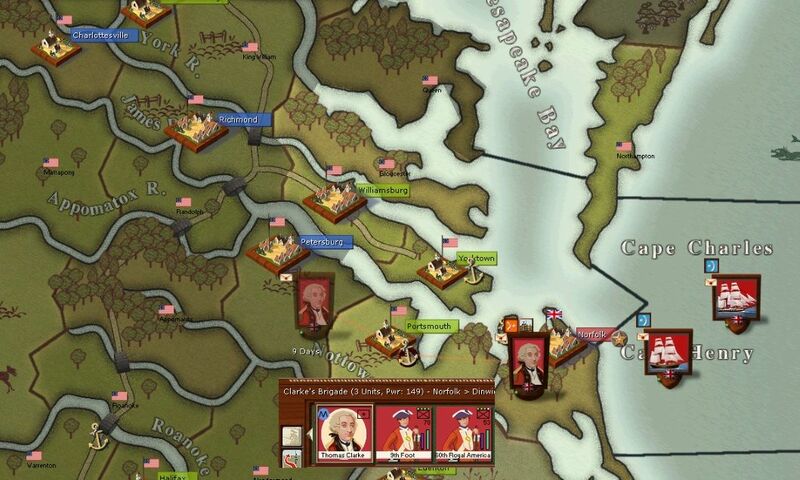 On the other hand the Continental Army looks to be in decent shape. It will recover cohesion but I'm not sure if there is enough supply at Albany for it to recover losses (remember this only happens if you are fully supplied). That is going to be important for how the main campaign works out this year. I think vigabrand perhaps made a mistake going for New York after his victory at Boston. There are a lot of cities in New England that produce a lot of supply so he could have broken down for winter (which is what I am doing around Philadelphia), in full supply and have a very defensible region for next year. On the other hand, Albany allows him to threaten quite a lot and if lost gives me a very strong position in the centre of the map. I break up the German led army at German Flats so that each portion can reach Oswego this turn. I'll take some hits but nothing too devastating and they can recover cohesion in time for the summer. 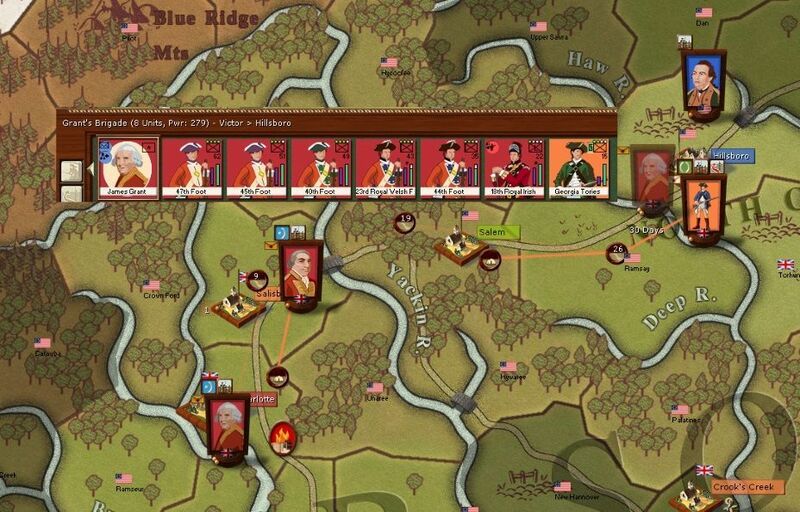 Also due to my control of a number of key cities, I gain a lot of militia replacements. Not the most useful but better filling out my replacement pool than going to the Americans.